Hmmm, I'm okay with spelling but commas are my nemesis. I'm really trying to learn where to use them but I still feel like I'm doing it wrong. I'm still fighting with passive verbs. It's sinking in, but not as fast as I'd like. LOL! I left a comment earlier and I'm pretty sure it didn't go through again. I need to stop doing that! I agreed with Jessica abou the commas, and added my frustration about semi-colons. I'm sure there are other faux pas I'm guilty of, but nobody has pointed them out to me, as yet. Thanks Susan, I am going to check that out. I fear an editor would choke on my writing! I think semicolon use is frowned upon these days. However, my understanding is that a semicolon separates two complete, but related, thoughts. Hmm, I can't help you with the commenting problem. Can anyone out there suggest a solution? Semicolons are frowned upon? Well, there you go! I told you there were faux pas I didn't know I was making. Thanks for clue-ing me in! Lol! And don't forget about those exclamation points - no, no, no. An editor will use her big red marker, never mind her red pen. Personally, I LIKE exclamation points!!! Sigh. I've had to bring it down a notch. I signed up to follow your blog, and I also posted a follow widget to my blog. Woohoo! I'm headed over there right now. My writing group has what one lady calls "punctuation wars." The other week, two of us were strong in our stand on a sentence like the following,"He is older than I." Most of the group sided with the one who had written "than me." I feel it should be "than I." I love it: "Punctuation wars." Whew, my instinct is to use, "me." Maybe the grammar site would give you a clear-cut answer on that one. Thanks for the tip!Going browse that site now. 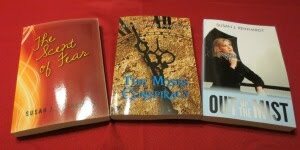 I hope you'll stop by often, and tell your friends about Christian Writer/Reader Connection.